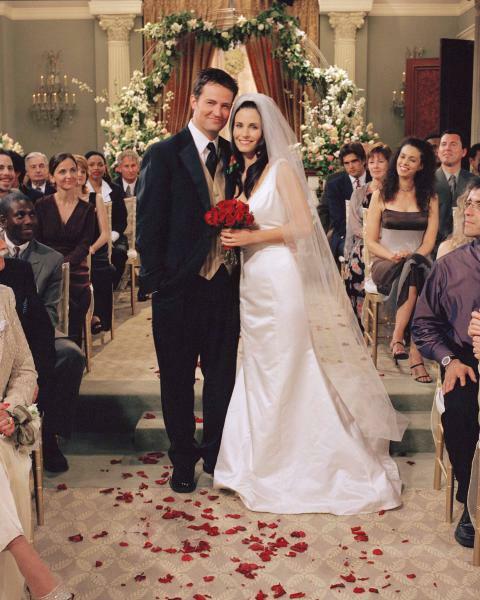 monica and chandler wedding 사진. . Wallpaper and background images in the 프렌즈 club. This 프렌즈 photo contains 명예의 신부 들러리, 하녀, 신부 들러리, 하녀의 하녀, and 들러리. There might also be 겉옷, 가운, 가운, 드레스, 부케, 코사지, 꽃다발, posy, nosegay, and 코 사지.